In July 2016, the University of Colorado (CU) Boulder earned LEED® Gold certification through the U.S. Green Building Council for the $9.4 million renovation and renewal of historic Ketchum Arts and Sciences Building. To achieve the project's aesthetic, sustainability and performance goals, Wausau Window and Wall Systems worked closely with Hord Coplan Macht (formerly Slaterpaull Architects) in Denver, glazing contractor Metropolitan Glass and Fransen Pittman Construction, as well as CU-Boulder. The 60,000-square-foot Ketchum Arts and Sciences Building's deteriorated, single-glazed, steel-framed windows were replaced with Wausau Window and Wall Systems' new, historically accurate, dual-glazed, aluminum-framed windows with thermal barriers and high-performance glass. "Respecting the facility's original design, all of the new windows showcase true divided lites and beveled profiles," said Russell Williams, Wausau's architectural sales manager in the Denver area. Supporting CU-Boulder's sustainability initiatives, the modern windows help optimize energy performance and thermal comfort, contain recycled content and use low-maintenance, durable finishes, as well as promote natural light and ventilation, and views with a connection to nature and the campus. In accordance with the policies of the Boulder campus and the executive orders of Colorado Governor's Office, all construction and renovation projects on campus must target a minimum of LEED Gold certification. 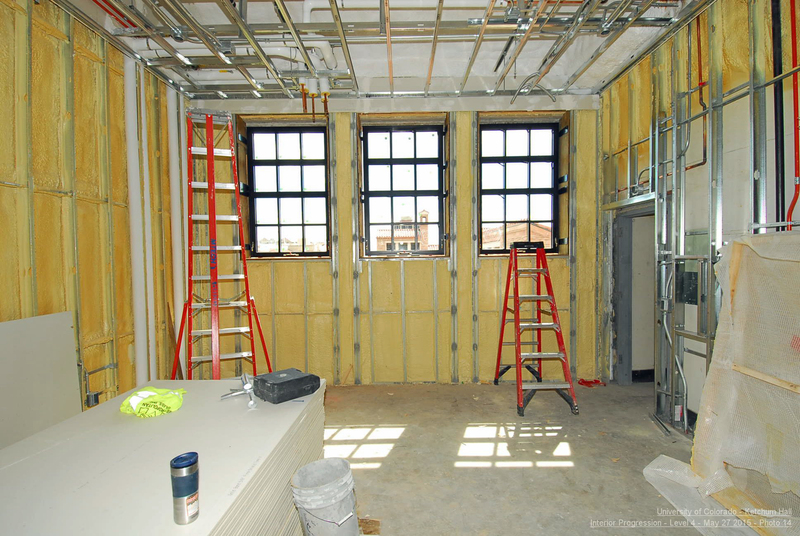 CU-Boulder's Office of Facilities Planning also noted, "The replacement of the windows with thermally broken aluminum frames and insulated glazing will significantly decrease the heating, ventilating and air conditioning loads of the building." "The Ketchum Arts and Sciences Building is a four-story historic structure with a garden level constructed in 1938 on the University of Colorado at Boulder's Main Campus," described Hord Coplan Macht. "The building is one of Charles Klauder's finest examples of Tuscan Vernacular architecture and is characteristic of the architectural style developed for the University campus. Although not a part of the Norlin Quadrangle Historic District, it is located immediately adjacent to it, and continues the historic character of the district. The... project is sympathetic to the historic character and materials of the building, while also updating the building to meet the objectives of the 21st century academic programs that are housed within it." 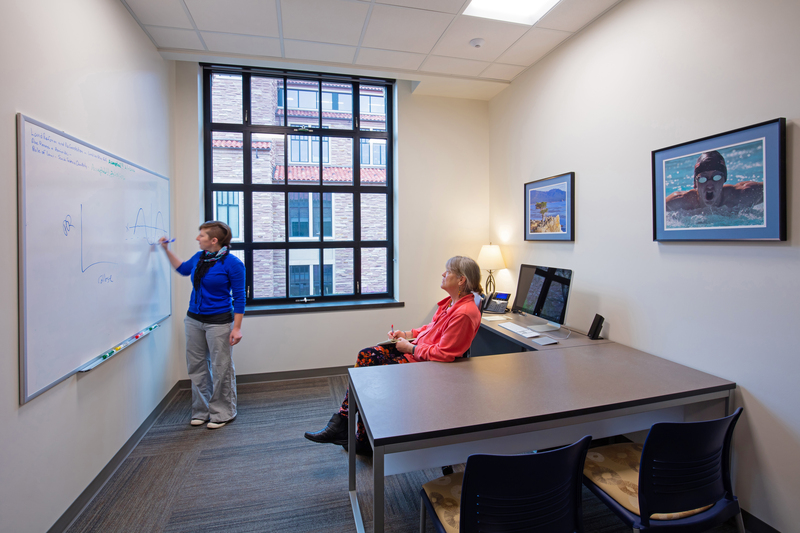 Thanks in part to capital renewal funding from the State of Colorado, Ketchum Arts and Sciences Building and CU-Boulder's students benefitted from a top-to-bottom renovation with modern mechanical systems, state-of-the-art equipment, a more-functional layout and upgraded windows. Beginning in Jan. 2015, Fransen Pittman removed the existing windows in 155 bays. With some openings spanning more than 20 feet high and 6 feet wide, Metropolitan Glass installed Custom Window™ by Wausau 8300 Series fixed and operable units. When the windows are opened, the natural ventilation offers a seasonal opportunity for air-conditioning energy savings as part of the facility's sustainable design. Wausau sequenced, crated and shipped the windows to Metropolitan Glass for phased installation. "Although the building was unoccupied, the campus was not," observed Amanda Hamill, project manager at Metropolitan Glass. "We needed to keep the students safely away from the lifts and equipment. We also were careful in how our heavy equipment was positioned on top of the network of steam tunnels that runs below CU-Boulder." Hamill noted another challenge: "Because the building's so old, each wall can have a different thickness, which makes installation of the windows much more difficult than in new construction. Overcoming the variation in wall thickness, Wausau created custom attachment clips that snapped into the jamb and made the process as smooth as possible." Along with ease of installation, Wausau engineered the new windows to mimic Ketchum's historically accurate look with equal sightlines and true divided lites, and to replicate their existing operation. Many of these oversized openings are configured with a large fixed unit stacked with both a hopper and an awning casement. 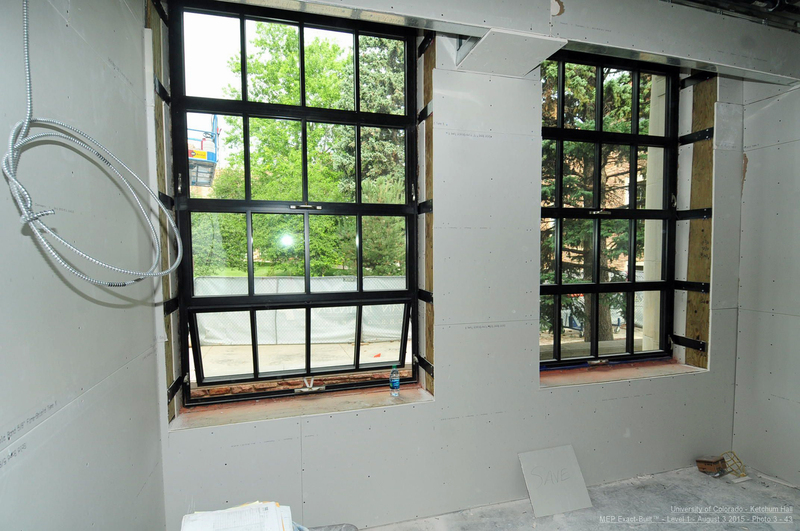 The windows' aluminum frames and muntins were finished by Linetec using a custom "CU-Boulder Black" color blended in its in-house laboratory. Adding further emphasis to the windows' aesthetic importance, limestone trim surrounds each oversized window openings in the sandstone exterior walls. The most visible window surrounds include ornamental sculpted stone flourishes. Minimizing both the potential for overspray on the masonry and eliminating volatile organic compounds (VOCs) at the job site, Linetec finished Wausau windows' aluminum framing in factory-controlled conditions in accordance the industry's stringent requirements set by the American Architectural Manufacturers Association – AAMA 2605 specification. "Coatings meeting this standard exhibit outstanding resistance to humidity, color change, chalk, gloss loss and chemicals for long-lasting performance that requires minimal maintenance throughout the buildings' lifespan," explained Linetec's senior marketing specialist, Tammy Schroeder, LEED Green Associate, explained. As an environmentally responsible finisher, Linetec captures the liquid paints' VOCs content to eliminate the exhaust of potential pollutants. The primary environmental concern with liquid paints is the solvents, which may have VOC content and must be destroyed safely. Linetec uses a 100 percent air capture system and destroys the VOCs with a regenerative thermal oxidizer, so there is no adverse environmental impact. Linetec then re-uses its heat energy byproduct to improve process energy efficiency. This process of re-use is completed before the material exits the paint line. The durable finishes also minimize maintenance and associated costs, contributing to the building's longevity and a positive, lasting impression. "This renovation means an awful lot," said David S. Brown, CU-Boulder's chair of the political science department who works in the Ketchum Arts and Sciences Building. "It's a signal by the state, the university and the college that what we're doing in the social sciences is important and worth the investment."